I’ve always been a little conflicted about the whole princess thing for little girls. No, I don’t believe that playing princesses is going to cause my daughter to have an eating disorder or teach her that her entire life is dependent upon finding a prince. But I do think our culture is entirely too focused on girls’ appearance and that the “princess culture” can contribute to that. At the same time, I appreciate Disney’s attempts to portray the princesses in their films as strong, brave, kind women who do a lot of good in the world. And I also appreciate the imaginative play I see going on when my daughter and her friends play princesses. So yes, I’m a little conflicted. But apparently not that conflicted, considering I just made my daughter a slew of new princess dress-ups to share with her friends. 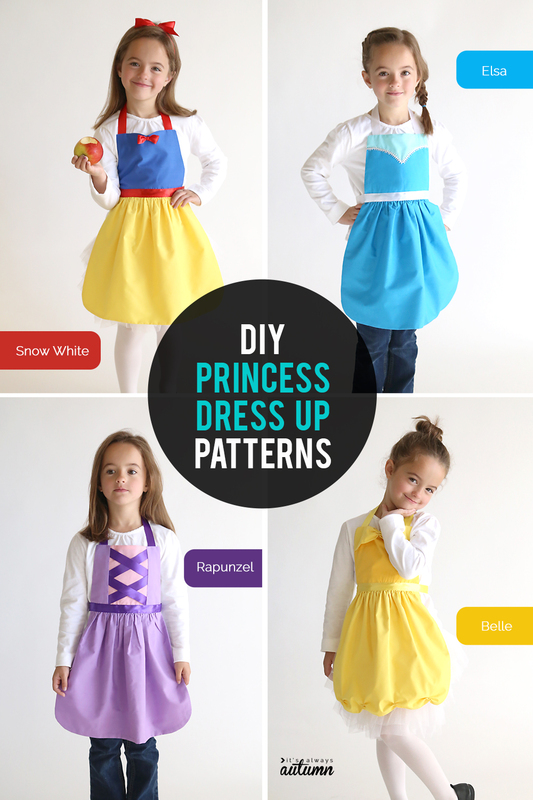 I’ve made four different princess dress-up aprons with free patterns. 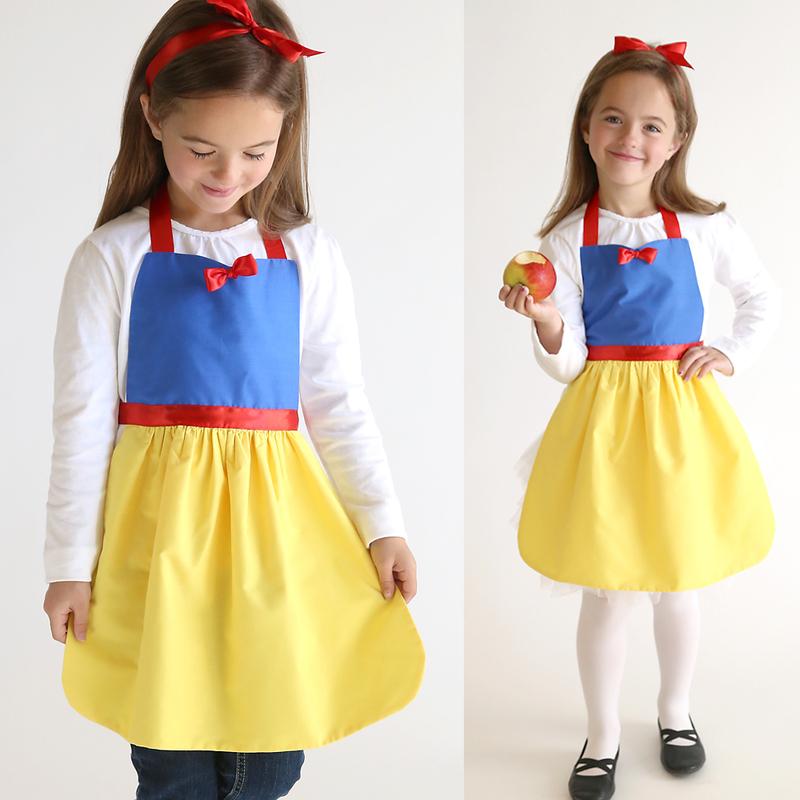 Click here for the Snow White apron, here for the Rapunzel apron, here for the Elsa apron, and here for the Belle apron. Dress up aprons are nice because they’re really easy to sew – I can make one in about half an hour – and they take less than a yard of fabric. In addition, since there are ties at the waist and neck, each apron will fit a variety of sizes. This ensures the aprons won’t get grown out of too quickly, and it makes it easy to share them with friends who come over to play. They also hold up to washing better than many commercial princess costumes, making them perfect for everyday play. Pair one with a fluffy white skirt (here’s the one I got!) for an easy DIY Halloween costume! After figuring out the easiest and cutest method for sewing up princess dress up aprons (IMO), I’ve created a free printable PDF pattern for you to download so you can make some too. The pattern I’m providing comes in three size: 2/3, 4/5, and 6/8 (although the largest one would probably fit 9 year olds too). A princess dress up apron would make a great handmade Christmas or birthday gift. 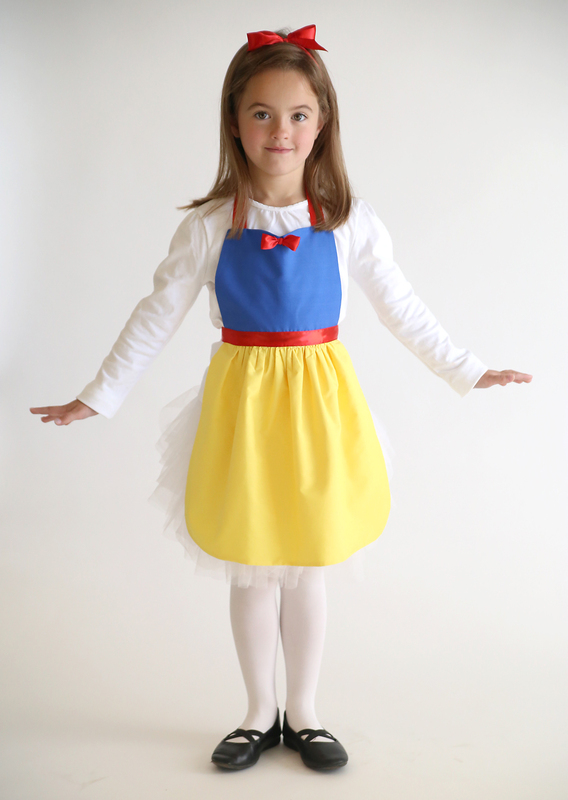 Today I’m going to show you how to make the Snow White dress up apron because it’s the simplest version. 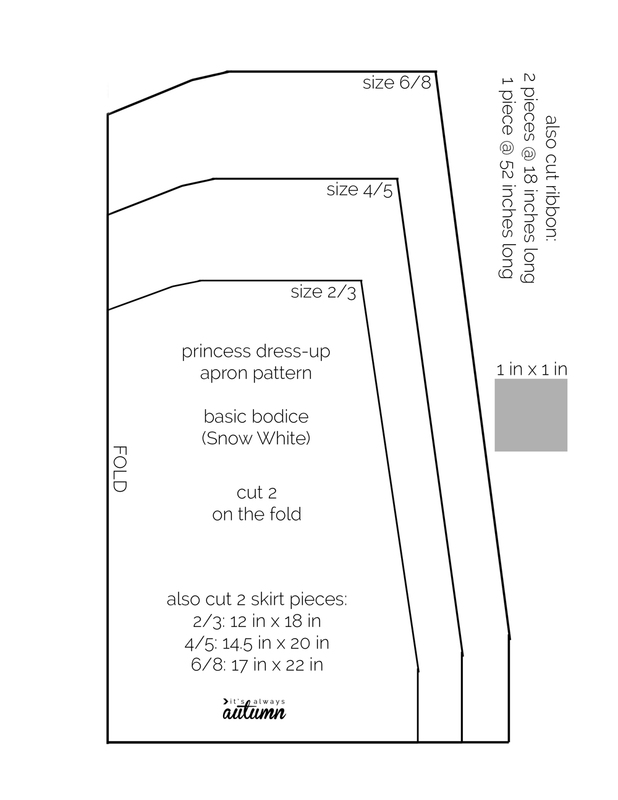 Then in the next week or two I’ll also share how to make a Rapunzel dress up apron, an Elsa dress up apron, and a Belle dress up apron, each with it’s own printable PDF pattern in sizes 2/3, 4/5, and 6/8. ***Update: all 4 patterns are now available! Click here for the Snow White apron, here for the Rapunzel apron, here for the Elsa apron, and here for the Belle apron. One last note: as I mention in the video, I use broadcloth to make these aprons; it’s cheap and doesn’t wrinkle as much as 100% cotton. You’ll find it near the quilting cottons in the fabric store. Mine came from Walmart and was only $2 a yard. I got my ribbon for $2 a roll at Walmart as well, making this a very inexpensive project. 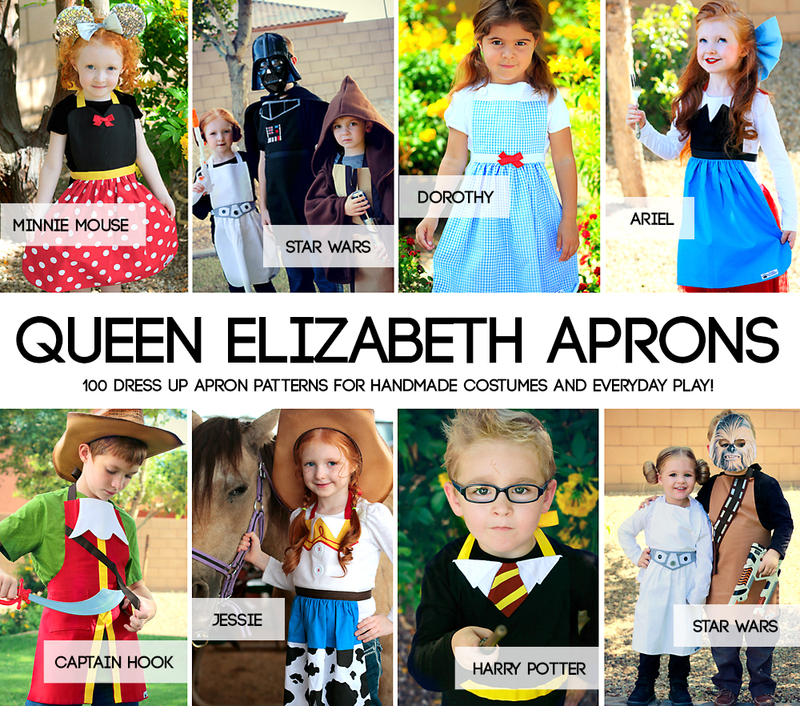 Click here for the Snow White apron, here for the Rapunzel apron, here for the Elsa apron, and here for the Belle apron. Cutest aprons ever. They would make great Christmas presents, Oh if only i didn’t have 18 grandsons. Although they are pretty awesome. Thank you Thank you! I have my sisters family and wanted to do something for my two nieces for Christmas. I’ll just have to make double so I have some for my girls as well. I have loved the apron idea but never wanted to figure out the pattern for them myself! Thank you! Holy smokes-you are the BEST ! I have never seen such fantastic instructions. Perfect! I wanted to make princess dress-up clothes for Christmas, but with a baby in the family again, my sewing time is limited. So cute! I think you need to do a boy version as well 🙂 Starwars perhaps or just boy dress up aprons…That would be cool as anything and then both my kids would have cools stuff! I say let girls play. Mine have, barbies and all, and abandoned it when they were ready. Darling aprons! These are the cutest dress ups and so much better than a full dress that is one size only. You are so creative. I love your site and pinterest boards. Thank you for sharing!!! I’ll be making all of your princess aprons this week for my granddaughter. Your video tutorial is absolutely fabulous! Your instructions are clear and well described. Thank you so much. My neices are getting an Elsa and a Rapunzel apron for Christmas. 🙂 I can’t wait to see their faces when they open them. I love this idea!!! My great granddaughter wants to be a princess everyday and she is only 2 1/2. I can’t wait to make her some. Thanks so much. I hate to say this, but with modifications you can make an adult size like for teachers or other adults and have a fun apron or a Halloween quick costume. I like the Star Wars ones. Great idea!!!! I have one word ADORABLE!! I love these aprons. I made the Elsa apron for my granddaughter and she refuses to take it off. I’m going to adapt the Rapunzel apron to make her an Arna apron now. These are just gorgeous! My tot is turning 4 in January and I’m going to make an apron for each of the girls for the party. Thank you so very much for sharing the gorgeous pattern and if you’d like photos of the girls, let me know and I’ll happily send them to you 🙂 So excited to make these! Oh my gosh! Such a cute idea for my grandchildren! Great for birthday or Christmas. Plus I give my grandkids gifts on the holidays as well – Halloween, Valentines Day, St. Patrick’s Day, Easter, etc. My great great nieces are going to love these. THE FOUR DISNEY APRONS ARE SO ADORABLE!! YOUR YOUNG MODEL IS OVER THE TOP BEAUTIFUL AND SHE REALLY KNOWS HOW TO PROJECT!! WISH SHE WAS MINE!! I have the patterns for the 4 free princesses but don’t know how to get the instructions to put them together. Some friends who are novice sewers want me to help them to make these. Where are directions? I had never sewed anything before, but I was able to make the Snow White and Belle aprons for my nieces, thanks to your very easy to follow directions! I’m looking forward to trying a few more. exactly where do u cu the pattern? do u cut on the black line for the size u want? I just made these for a friend. Sewing the apron on “backwards” and putting the ribbon over the seam is genius! They turned out super cute and am making more for other friends. Thank You! Do you make any of these patterns in adult sizes? I teach and this would make a great costume especially since we usually have conferences after out Halloween Party. Hi Autumn, Many thanks for the pattern, instructions and inspiration. I am having fun making some aprons for a little girl’s Christmas box. Thank you. Thank you so much for sharing these patterns and posting a video tutorial! This is actually my first sewing project ever attempted and I have to say, they turned out far better than I was anticipating. My nieces will love them! I made them a “cookie in a jar” kit for christmas and these Princess-inspired aprons are going to be the perfect addition. Thank you again and Merriest Christmas! Thank you for this tutorial !! I love it , you make it so easy and so quickly. I hope I can do the same !